When Outlook 2013 automatically saves draft, if you receive "The operation cannot be performed because the message has been changed" message, try this fix. For a better user experience, the e-mail composing programs save drafts automatically before you send the e-mail. Thus, when we have to compose longer e-mail messages, the automatic draft saving helps us a lot and we don’t need to save the draft manually. The operation cannot be performed because the message has been changed. If this happened, then you can copy the message quickly by creating new message and in this way you’ll be able to sent longer message before Outlook starts saving its draft. However this workaround looks quite unprofessional if you’ve to sent a huge number of messages on daily work basis. 1. Press + R and type Outlook /safe in the Run dialog box and click/tap OK. This will open Outlook 2013 in safe mode. Verify if the issue persists in Safe Mode. It may possible that problem can’t be reproduced in Safe Mode and you can use this workaround if you’re comfortable with it. Else you may go ahead with steps mentioned below to get a selective fix. 2. Next, open any file in Outlook and click FILE option at top left corner of program window. 4. Then in Outlook Options window, select Add-Ins in left pane. 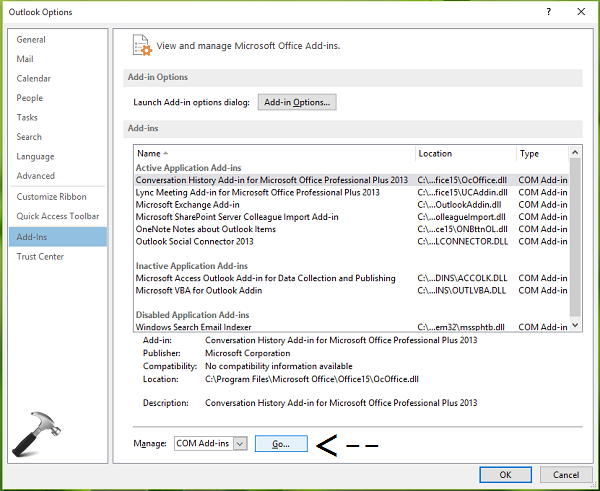 In the corresponding right pane, select COM Add-ins against Manage and click/tap Go. 5. Finally, in the COM Add-Ins window, use the hit and trail method. That is, disable the add-ins one-by-one and check if issue exists. In this way, you’ll be able to locate that add-in which is root cause here. If you don’t rely upon add-ins, you can disable them all and get rid of this problem. Click OK when you’re done. Hope this helps! Additionally read how to enable Developer tab in Outlook/Office 2013. [FIX] Cannot Start Microsoft Outlook. Cannot Open The Outlook Window. The Set Of Folders Cannot Be Opened. [FIX] Outlook Could Not Create The Work File. Check The Temp Environment Variable. Thanks for advice! It helped. I do receive this message “the operation cannot be performed because the message hs been changed.” when I try to flag an email. Thanks Kapil, your clear and detailed explanation has solved this for me. It has been driving me nuts since I migrated to Windows 10 and Office 365. My issue had to do with just viewing emails and then trying to move them to another folder. I found that I had to temporarily select another message before I could re-select the message and delete or move it. Since I disabled the add-ins I don’t use, it has been working like it should. …and flagging/unflagging messages worked like a charm. I’m not sure which of the three did the trick, but I don’t need any of them so I’m not going to investigate further. This helped me too. Thank you so much. Really stressful going in and all of a sudden nothing works. I spent hours on some of this already aka syncing to outlook.com and I am glad I found this dialog.